at the Hilldene shops in Harold Hill, the annual Christmas light display will be switched on. The Council have arranged much entertainment and many local organisations will have their own stalls with much to sell, just in time for useful Christmas presents. The Friends of Dagnam Park will be there, situated near to the Pound Shop, heavily laden with a variety of useful goods, including the 2019 FODP calendar. Priced, as last year at £5 each. We will be there from midday to around 7pm. Last weekend saw one of the biggest turn outs for people joining in on our last organised litter pick for the year. With over 20 bags collected up and deposited in the car park and by bins waiting for the council to collect them this morning. While the main group of people went off to cut and remove old barbed wire and collect rubbish the two white gate posts were rubbed down to remove the rust and were then given a fresh coat of paint. This has been one of the long term aims of the friends group in so much that we clean and where possible make items in the park left over from it's days as a private estate, sound so that future visitors to the park will be able to view them. I would like to extend my thanks to all of those who attended over the weekend as without them participating in the work that the Friends group carries out the park would not have the same appeal that draws people in to use it. If any readers would like to become a member of the Friends of Dagnam Park and/or help in any way then please use the email address above to apply for membership ( a small fee is required which goes towards funding for the group, to obtain materials such as tools to carry out their work, its website which records the history and wildlife of the park and gets the message out there of the Local Nature Reserve and also helps when asked for match funding for grants etc ). There is still much to do in the park and as more people get involved it will ensure the park's future as a place where local residents and others will want to use. saw the start of an exhibition in Havering Museum (High St Romford) entitled, Dagnam Park Its History and People. It closes on Saturday 27th October. The museum is open Wednesday to Saturday 11 am to 5 pm and usual admission prices (£3) into the museum apply (last admission is 4 pm to galleries and 4.30 pm to museum shop). This will be a chance for all those who have been following the activities of the dig team on social media to see some of the finds that have been uncovered. It will also give people a chance to see some of the history behind the park and mansion in a museum setting. With the local elections almost upon us. It is worth considering who will best assist us- the Friends of Dagnam Park, in our continuing campaign for the boundaries of the Manor to be formalised and designated as a Nature Reserve. Over the past two years Don and I have met Head Councillor Roger Ramsey many times to discuss this issue. On each occasion he has stated that the reason for such a delay, is the legal department have a heavy work load and a low staffing level. However after being repeatedly told this for such a long period, the excuse is now wearing very thin. So the new administration, who ever they maybe, will be contacted again for an explanation of their plans for these "redundant fields" as they were described. Will they be built on or formalised as Nature Reserve. Unless we are given an exact date for formalisation, we will have to start another campaign to pursue our objectives. The ten hawthorn trees granted by Aviva are now planted in the avenue from the car park to the house site. The FODP have responsibility to water them during the dry periods. We also have ten oak trees planted at various locations, these came from LBH who were granted trees for the borough by the government. Finally we are planning to have a sponsored walk in aid of the St Francis Hospice. The route will be around the nature reserve on Saturday 19th May 2018 starting at 10am. There will be signage and marshals along the way. We will be providing light refreshments. There will be an entry fee of one pound per person ( this will be donated to the Hospice). You can also organise your own sponsors, forms can be emailed to you. If interested please let us know ASAP. A new page on the archeological dig has just been uploaded. It includes photographs and a written account of the work to date. The dig team will be resuming their excavations of the Dagnams mansion weather permitting. All are welcome to join in on this to discover the size and layout of the house and it would be nice to see some new faces. The dig team meet up at the site of the house adjacent to the Lily pond on Monday and Friday mornings between 9.30 and midday. Even if you can not take part in the dig all are welcome to pop along to have a chat whilst walking in the park. UPDATE 29-11-17. The FoDP entry has reached the finals. Alan York will complete the next stage and then we will have to vote again. So watch this space. We are now exploring the house foundations. We started at the west wing. However we found the scrub at the site needed to be cleared. So LBH Tom Fradd and crew assisted us with the use of their heavy duty hedge cutter. As the waited for this work to be completed we moved acoss to investigate the east wing kitchen/domestic area. As only having a rough idea where to dig the first test trench, found only rock hard mud. Further test trenches also came to naught! However we could see, near the brown gravel path that divides the house from the stable block, was a small area of concrete. This was a good move as two weeks later we now have exciting results. Don had blown up a detailed map of the house, this has highlighted points and paths we had not noticed before. Plus on digging to a depth of three feet discovered three floor levels on top of each other. This displays that over a long period going as far back as the 15th century, the kitchen area had at least three make overs! When Richard Neave purchased Dagnams in 1772 he knocked down and replaced the family area but kept the same kitchen. Although most probably ( although as yet, we have insufficient proof ) then made improvements to the kitchen/domestic area. Finally news of the calendar. As we have received requests for at least 130. We will now order a print run of 150. Unfortunately this will be a large pay out of £592. 50p. So pleased, to those who have put in a order-- don't let us down. Pay either in cash or chegue, (to; Friends of Dagnam Park) or you can pay by bank transfer, if so contact me and I will give you the sort code and account number. The final date for sending in your photos has been brought forward to Sunday 22nd October 2017. This will give the printers more time to finalise our increased order. 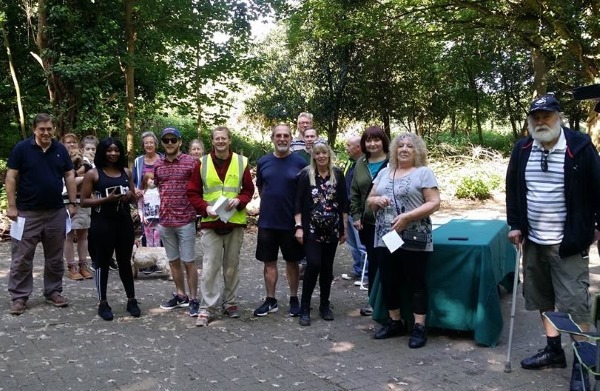 Don Tait reports great news from the London in Bloom judge as the park has retained its Gold award from last year which means that we have to strive to stay on that level over the next twelve months until judging takes place yet again. Set out below are the judge’s comments which accompany his markings for the park. “The judge can confirm that the standard of Gold has been maintained, with the site still offering considerable benefits to wildlife and people. It was good to see a couple of enclosed areas where it is assumed that an investigation is taking place as to the differences between controlled and non-controlled habitats. The Fallow Deer population continues to grow and many young and recently born animals were seen. The invertebrate population is in abundance with many species of butterfly being seen birdlife too is thriving. The improvements to the fishing pond with the addition of new platforms is to be applauded. Despite previous rumours and council ambitions to use part of the land for a solar panel array has not happened yet. Dagnam Park is a most precious resource for wildlife and local people and London and the Council should consider ways in which to protect this site, perhaps creating a SSSI or to give it, local, regional or national recognition for its nature, also to increase visitor numbers so that a wider audience can enjoy and celebrate this outstanding site" Peter Holman – Judge. Click for a full account of the history of the "Save the Manor" anti solar farm campaign. As of this morning, Monday 24th April 2017, work has commenced on the Green lake to improve the bank of the lake (wooded side) and to remove the existing red metal swims from the edge and replace them with more sound and safer ones. The fishing club will also be renewing the disabled swim and will make this safer to use. Other work on this lake will be forthcoming and whilst they are doing this work on improving the lake and its immediate surrounding area for anglers and park users alike parts of it will be cordoned off from members of the public and park users are asked to keep their dogs under control/on a lead when in the area. There is no time limit to when this work will be finished but it is hoped that any inconvenience will be short lived. To get the equipment to the water the large concrete bollard on the edge of the car park has been removed and will be replaced once work has been finished. All work on the lakes has been authorised by the parks department and the FODP committee members are being informed of the work and it's ongoing progress. As well as the work on the Green Lake, both the Green Lake and the Lily Pond have been closed to anglers as the club is concerned about the health of the fish, as some have been found dead. The water is being tested by the Environment Agency as are some of the fish and until the results are back from them there should be no one fishing either of these lakes. The parks department is aware of this as are the Parks Police who will ask anyone found fishing during the period that the waters are closed off to leave. If any member sees people fishing either the Green Lake or the Lily Pond please report this to the Parks Police who will deal with the situation. It goes without saying really but can members make sure that their dogs do not go into either of these waters whilst it is closed off to anglers and whilst it is being tested by the Environment Agency. We have now fulfilled the fifteen criteria set out by the London Borough of Havering that they deem are necessary for us to to retain our official "friends" status certificate. All friends groups must have a capital project to receive the annual £1000 grant. This year's (2017-8) agreed joint Friends/LBH project is a make over for the Settle Road entrance. As first impressions count, the gated area which has become run down and scruffy will have new signage (approx. cost £2000) erected, the gate painted, unnecessary metal supports removed and the foliage cut back. Some really good news. The Leader of Havering Council, Roger Ramsey announced at the Council meeting on 22nd March 2017 that the plans for a solar array in Dagnam Park and the surrounding land have been abandoned entirely. Congratulations to the FoDP and all the other park users and campaigners for their heroic campaign of opposition. Now we need to keep up the pressure and get all the land formally included within the Nature Reserve..
Latest total of petition signatures is 5716. The paper signatures will be handed to solar park project manager Mark Lowers on Tuesday 15/11/16. Don and Alan will be meeting Mark Lowers this Thursday 10am. On the same day at 2pm Don and Alan will be giving an illustrated talk at Harold Hill's new library about the friends group activities and the history, flora and fauna of Dagnam Park through the centuries. All Welcome. Entry free but a charge of £1 for tea an coffee. Havering Council are undertaking leafleting in parts of Harold Hill and Noak Hill. The leaflet and accompanying letter sets out their proposals for a solar array in the public open space (generally accepted as part of the Manor) north of the Nature Reserve proper. The leaflet is light on details but it is part of LBH consultation and it is important that you make your views known to them before the end of October. You can see the leaflet here or download it here if you prefer. September 2016. Once again we are winners in the London in Bloom event. Silver gilt and gold. 21st July 2016. Threatened Solar Array. There are serious concerns amongst many of our members and other park users concerning the threat of a huge solar array being built on a large area of our nature reserve. FODP have written to every Councillor on the London Borough Havering Council. We will report back here as soon as we get a response. You can read all the details of the current threat here. July 2016. Sir Thomas Neave owned a nationally important collection of stained glass roundels held at Dagnams The collection was broken up and dispersed after the the second world war. Sam Fogg galleries of London has recently commisioned a booklet on the glass entitled "Silver-stained roundels and stained-glass panels from the collection of Sir Thomas Neave, Dagnam Park, Noak Hill (Essex)" by C.J. Berserik and J.M.A. Caen (The Hague-Schoten, May 2016, edited by Matthew Reeves). FODP are grateful to Sam Fogg for permission to reproduce it. It can be downloaded here. The next dates for clearing the stable area of the park are yet to be arranged. Please join us if you can, meeting at the site 9.30am. However if the weather forecast is wet take it we will cancel. Although some tools are provided these are limited so if you wish to turn up to help and you are able to bring your own tools it really would help. The area that the FODP volunteers will be working in is situated on the right just past the two white gate posts on the main drive heading for Noak hill. The first phase of this project has been done with the cutting back of fallen trees and dead wood by the parks department so that the volunteers can work in safety. The next stage is for the group members to clear up the stable area. Because of the size of the project the FODP are looking for anyone who may be interested in joining them to help out on the clearing. High viz jackets (to say that you are part of the group) as well as gloves etc will be provided. This will be an on going project as other work in this area is being looked at and anyone turning up on the day will be updated on progress. Wonderful historic photos of the Noak Hill School in the 1930's And Straight Road School in the 1940's have been provided by former pupil Jean Peacock. Mr Trevor Dawson, of Barnstaple Road, Harold Hill, who dumped several black bags of domestic waste by trees near his home, ended up paying £612 for fly-tipping. Mr Dawson admitted the offence and accepted a Fixed Penalty Notice of £50, which he subsequently failed to pay. On Friday 21 August 2015, at Barkingside Magistrates Court, he was fined £150, with £442 costs and a £20 victim surcharge, which totalled £612. Sept 2014....Sadly Ernie Herbert (Herbie) died last month in sheltered accommodation in Harold Hill. Ernie was a devotee of The Manor from the 1950's right up until infirmity prevented him from visiting. In latter years he became an enthusiastic historian focusing on Noak Hill and Harold Hill and much of his meticulous and well researched work can be found on this site. A more detailed obituary will be published once I have fully researched the history of his life... Del. July 2014 Feasibility study published. April 2014; Havering’s Wildlife Crime Officer, PC Anthony Kiddle who actively covers Dagnam Park has been awarded Borough Wildlife Crime Officer of the year. Congratulations to him from the FODP. The AGM of The Friends of Dagnam Park took place on Wednesday the 26th February 2014. The guest speaker was Mary Smith a noted local botanist, who gave an illustrated talk on the flowers of Dagnam Park. March and April 2013, Litter Pick photos. Harold Hill Police station 60 years ago! 20th March 2007: Again positive news to report during the month of March to date only few sightings of bikers. Remember we must remain vigilant and continue the campaign against this type of anti-social behaviour in our parks. 22.2.07...............DEER POACHING..............Deer once a common site in this area, have now sadly been depleted by unlawful poaching. We need your help to gather information. Has there been a vehicle in your street, which does not belong there? Have you heard or seen anything suspicious? Do not tackle these people yourself. Please contact the police. A meeting of the Friends has been organised at Pyrgo Priory School on Monday 11th December at 8pm. This will be the last meeting that Gaynor and I can attend because we are moving to Scotland the following day. The Friends will need to reorganise a little and I know that we already have some volunteers to take on some of the organisation and the website. We hope to see as many of you as possible on the night to say our goodbyes in person. March 2006 .....................A Modest Proposal .................................Read On. Work Started Today on the long awaited steel fencing around the five minor entrances to Dagnam Park, at Tring Gardens (2) Sedgefield Cres (2) and Whitchurch Rd (1) Our thanks go to Pete Williams, Andy Casson and all the other staff at Havering Council who have been working to these ends for some time. Credit must also go to all those members of the Friends of Dagnam Park who have been pressing for this for some years. Its only the beginning of course, but its a good start to our list of priorities. Dear Cllr Mann, in recent years it has become the practise of a minority of local residents to dump rubbish in the streets of Harold Hill in the hope that the refuse collectors will collect it. The refuse collectors remove all that is within their contract and leave the rest. This can be carpets, furniture and even white goods, as well as garden or other refuse in the wrong bags. We are sure you are well aware of the problem. We are writing to urge you to collect this rubbish far more quickly than you do and probably more importantly take action to prevent the recurrence; maybe a well publicised prosecution would have some effect. We are sure that a bit of effort in this direction will be more cost effective in the long run. In the meantime can you arrange to clear the large amount of bags and other rubbish scattered along Gooshays Drive. Go to photos of the circle of trees taken in 1964 and 2004. I'd like to take this opportunity to introduce myself to the ‘Friends of Dagnam Park, and the Manor, Local Nature Reserve'. My name is Andy Casson and I have recently started as the new Havering ‘Wildspace! Community Liaison Officer' (CLO). Many of you will have been familiar with the previous officer Richard Cottam who earlier this year moved on to pastures new and is now working as a ranger in the Lee Valley Park. I have a background in working with local communities on regeneration and environmental projects across East London and am currently picking up where Richard left off. I will be focussing my attention on designating two additional Local Nature Reserves at the Ingrebourne and Rainham Marsh areas, and will also be continuing to support the work of the ‘friends of group', looking to move forward with the list of work priority issues raised by the group, reducing motorcycle access points being foremost. I have already met a couple of group members and explored the Repton Landscape, and am looking forward to meeting more members in the future, through walks, talks and activities. The Wildspace! Project is English Nature's grant scheme for Local Nature Reserves which involves local communities in the improvement, care and enjoyment of their local environment. 19th February 2005 ................ Following the London Borough of Havering' Public Consultation on the Priorities for the new Nature Reserve, members consulted and submitted the following proposals .................................................................................read more. At last nights Havering Council cabinet meeting it was agreed to declare the council owned land at Duck Wood and Dagnam Park, including Hatters Wood as "The Manor Local Nature Reserve". Very good news indeed, but only the beginning. Thanks to Richard Cottam for passing on the news. 6th June; Ancient meadows walk takes place in dry weather! ..read more..
11th May; Dagnam Park Nature Reserve ....read more..